I have a lot of mixed feelings about this book, so bear with me. To sum up how I feel in one sentence, I would say, "Snow Like Ashes is good, but..."
Sixteen year old Meira is an orphan and a refuge, living life on the run after her kingdom, the Kingdom of Winter, was conquered and its citizens enslaved. She was among 25 other Winterians who escaped the night that Winter fell. But 16 years later, the number of Winterian refugees has dwindled to 8. Though their numbers are small, their spirit is strong, and Meira and the other survivors are determined to get their kingdom back. Meira is raised alongside the future king of Winter, Mather. Both were babies when Winter fell, and they are family, best friends, and maybe even a little more. I really enjoyed reading most of this novel. For starters, Raasch is an excellent scene to scene writer. I was totally engrossed in every scene and all the action that she wrote in. It was captivating, well written, and page turning. Her weakness lies in the main plot. Raasch tries to foreshadow a bit, but really, you could tell when something was coming because when she started writing about it, it just didn't flow like everything else. When it got right down to driving the plot, it was abrupt, out of place, and spelled out. There were zero surprises for me because of that. I would say that Raasch tried to write this novel like it was a movie. It read like a movie rather than a novel. Does that make sense? The way everything happened, the way she wrote, it was just like a movie without any of the subtle rewards that you earn from reading. It made more sense to read the book with dramatic music in the background. Writing this way also made a lot of the "revelations" in the book confusing and disorienting. I just wasn't on board with the way the giant "twist" in the plot was written. Now, having said that, the stuff she was writing was still awesome, it was just difficult to understand some times. Like I said, this book deserves a read if only for reading the scene to scene/character interactions. I enjoyed reading those and they were fast paced. Meira is a great main character. She is tough and doesn't take any crap. You know those annoying heroines that rush into things when everyone is telling them not to <cough *Clary Fray* cough> and they just mess everything up? Meira is not one of those. When she goes after an injustice, she does it right and I loved that. She gets things done and she shows no weakness. She does have her weaknesses though, and she makes for a pretty well rounded character. Meira wants to be considered a solider and hates the idea of dresses or being called a lady, yet she is totally boy hungry. Some times it doesn't make sense for a tom boy to be so boy aware, but at the same time I like that she can be tough and "one of the guys", but still stand apart as a super feminine character who likes gaping at pectoral muscles. There is romance in the book, but I feel like I can't say much more without giving too much away. All I can say is that it seems like it's clear cut, solid romance until about 3/4 of the way through the book. Then it's confusion and I can't tell what exactly is happening or where it's going. But I did love the way the romance was written. I loved it enough that I will read the next book with no hesitation, partly because I want to find out what happens. I'm completely intrigued and confused. I was surprised at my attachment to Raasch's characters by the time the book ended. I felt like I knew them. Raasch tied this book up into a solid great ending. Complete readers satisfaction, with just enough questions to make you excited for the next book. So. 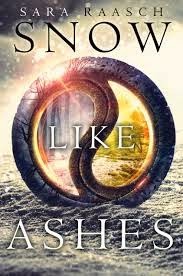 Snow Like Ashes was really good... but there were some really annoying bits about it. I suppose many books are like that, but these annoying bits could have been enough for me to quit the series right here, if the good parts hadn't been amazing enough to make up for it. It is a Winterian delicacy to have frozen berries, so I thought there could be nothing more perfect than a cold berry smoothie to go with this book.